Great for Costume Garb or Day-to-Day Use. Camisia Large Black - is a closeout item and is the last we will carry. A hip, stylish renaissance shirt for women, worn alone or underneath another garment 2 respondents The correct answer, of course, is 3., one of the Spice girls. But it's interesting to note that ther is such a varied response to . (Editor's note: Knock it off. The correct answer is 5. Please do not do any more fake surveys in your product descriptions). Whatever. Viva Forever. That's what I always say. Anyway, this is a gorgeous shirt. It's one of the few pieces of renaissance clothing that can actually cross over into contemporary fashion. That's right, this shirt can be worn with renaissance garb, or as a great top with your standard, plain, ordinary, lifeless contemporary clothes (how is it that with all our technological advancements since the renaissance, we ended up with inferior clothing styles?). 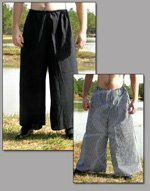 The Camisia is made from a light, breathable cotton. 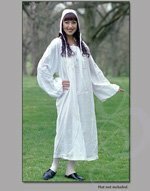 It features three-quarter length sleeves and a drawstring neckline. It also sports some seriously stylish ruffles at the sleeves. Wear this one under an outfit as a cooler chemise or wear by itself, with a ring belt or sash.